Last week Tyler and the third grade team spent the day harvesting beans for drying to plant in the spring. They also got to snack on the last of the fresh beans with parsley hummus! 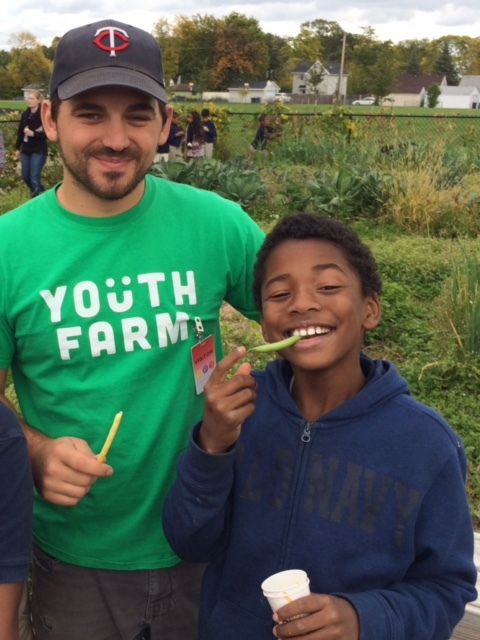 Throughout the fall the third graders and fifth graders at Nellie Stone Johnson Community School will put the farm to bed for the winter by harvesting the last of the greens, seed saving, and mulching. Tyler was also excited to see former West Side Youth Farmer, Jerome at his new school on the Northside. Previous PostPrevious Powderhorn Empty Bowls is coming up! Next PostNext THANK YOU Tyler!